Darwin, the monkey who made it famous in an Ikea parking lot, has inspired countless memes and possibly even a tattoo. The latest in a story that's spun out of control is a bit of monkey business. An online video game, to be exact, created by a Seneca College animation professor and several former students, according to the Toronto Star. The website where the game is hosted is also selling T-shirts designed in Toronto that depict the Ikea monkey puzzling about an Allen key. For $20, you can sport Darwin's shearling coat, too, or at least you can wear a picture of the monkey wearing the coat, which is basically the same thing, right? 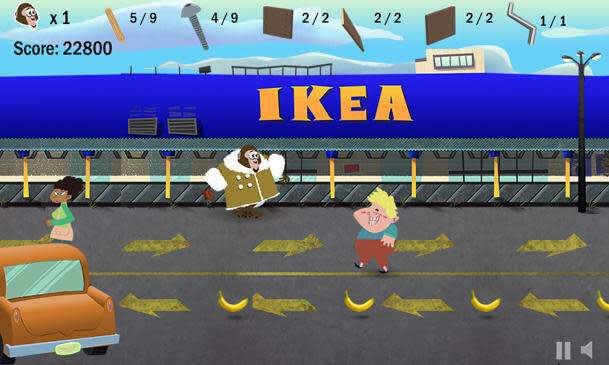 You can also play the free video game online, which involves helping Darwin navigate through the Ikea parking lot while collecting boards and screws to build a shelf. Players must dodge shopping carts, customers and cars but they can throw poop at obstacles to get past them. The introduction to the game refers to the conflict between Darwin's owner, Yasmin Nakhuda, and Toronto bylaws, which state that a monkey is an exotic animal. "Maybe it will get to go back with its mother her [sic] at the end of January? For now let's help him build an IKEA shelf for his new temporary home in monkey jail at the Story Book Farm Sanctuary." When players die, which they will, the game berates them for incompetence. "You let ÏKEA MUNKË die before he got to build a friggin' shelf. What's wrong with you?!" the game says, while showing a sad image of a dead cartoon monkey. Meanwhile, the real-life situation remains serious. Nakhuda's lawsuit to regain custody of the monkey is before the courts. People Think Prince William and Kate Middleton Snubbed Meghan Markle in This Photo, but I Call B.S.